2009 LEL Officers from left to right: Officer Jay Sjogren, Lt. Daniel Welborn, Officer Blain Hatch, Sgt. Kelly Swihart. Fairbanks Officer B. Safe during 2010 Fairbanks 'Operation Glow'. Photo courtesy of Lt. Daniel Welborn, Fairbanks PD. The Alaska Highway Safety Office and the National Highway Traffic Safety Administration Pacific Northwest Office work with the Juneau, Fairbanks, Wasilla and Kenai Police Departments to foster Alaska's Law Enforcement Liaison (LEL) program. Trained LEL Officers serve as a bridge of communication between the Highway Safety Office and state and local law enforcement agencies to improve the development and implementation of statewide initiatives focusing on traffic safety, education, and law enforcement. Enable constant communication between the AHSO and the law enforcement community. Communicate the traffic safety priorities of Alaska. Promote traffic law enforcement of DUI and seatbelt laws, aggressive driving and child passenger safety. Help identity effective traffic law enforcement tactics and communicate these best practices to law enforcement agencies. Alaska's LEL officers work with the Highway Safety Office to help foster a close working relationship between the law enforcement community and the HSO. The officers above were chosen because of their deep rooted commitment to this idea and it is our hope to see many more join their ranks in the future. Chief Lindhag, Chief Supkis, Chief Hoffman, Major Mulhollen, Chief McGee, and Chief Greenleaf receiving their awards. Photo courtesey of Lt. Dan Welborn. Captain Barrick shakes hands with Lt. Welborn after receiving his award. 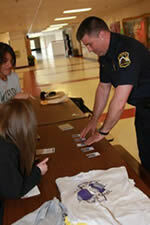 Kenai Central High School students team up with the Kenai Police Department to promote seatbelt use. 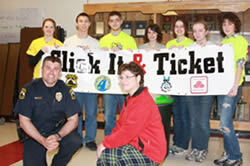 The week-long event was called "Click It & Ticket".